Drop down longboards have a special shape that makes the section of the deck where you stand on (aka the standing foot platform) closer to the ground than the truck mount points. A drop-down deck curves and drops down between the trucks so your feet sit lower to the ground than the mount holes. discuss what makes drop-down longboards so special. The Atom drop deck (Amazon) is extremely popular because of its very affordable price (around $100) and pretty decent quality. I’ve included it here because it’s a very good low-riding drop-down option for a beginner or a more experienced rider looking for something that’s very easy to push and commute, carve downhill, or learn to slide on. Sized 41″ by 9.5″, the Atom Drop Deck is a large sturdy (relatively heavy) deck built from solid 9-ply maple. It has a significant drop which makes it very low to the ground, hence super stable at speed and uber-comfortable for distance pushing. The Atom is also a nice carving board because of the large wheel cutouts which allow tight turns with no wheelbite. The 50º RKP trucks are good quality knock offs that make the ride smooth and responsive despite the Atom’s size. The 70mm wide lipped Atom wheels are fast and grippy, well-suited for downhill carving and commuting. Their soft 78A durometer, combined with the Atom deck’s slight flex, helps dampen the ride quite well on uneven pavement and sidewalks. Overall, the Atom Drop Deck is a good quality drop down longboard for commuting and freeriding. The effective deck shape and decent components make it a responsive, stable, and comfortable board to carve and travel on. It’s not the most portable longboard, but that’s not what it’s designed for. Riders find that lubricating the bearings with speed cream much improves the board’s performance. Check out the Atom Drop Deck’s price and countless positive reviews on Amazon. The Globe Bannerstone is a comfortable 41″ by 9.75″ drop down longboard with an ample 32.5″ wheelbase designed primarily for distance and speed. This dropped platform is very low riding and provides the stability you need for going fast downhill. It makes pushing over long distances easy. The 1″ slanted drop gives you secure foot lock-in for throwing big slides at higher speeds with confidence. The deck is made of bamboo, which makes the Banerstone a very attractive board. It also gives it a bit of flex albeit without affecting stability at speed. The deck also has a slight side-to-side concave, adding to the secure feel when riding fast. A small caveat to this board is that the bottom of the deck can sometimes touch the ground if you hit a big bump. The Bannerstone comes with 180mm Slant 50º Reverse Kingpin trucks which make the board smooth and responsive for commuting and pushing distance. The trucks are also stable and responsive enough for going fast on steeper hills. The large 72mm wheels are fast and soft enough (78A) for riding smoothly over all kinds of terrain. In short, a great comfortable drop down longboard for freeriding and sliding at higher speeds and for efficient distance commuting. See the reviews and pricing on Amazon. The Landyachtz Switch is the priciest in this list, in the $200-$250 range. I thought I should include it here because it’s a premium drop-down longboard designed primarily for serious freeriding. It’s been around for years and is among the most highly regarded freeride boards out there. At 40″ long by 10″ wide, the Switch is wider than the Bannerstone and the Atom (though 1″ shorter) giving it an ample standing platform for maximum comfort when riding fast downhill. It also makes this board well-suited for taller riders with large feet. The Switch has a significant drop (this ain’t no micro drop!) for a very low and stable ride when going fast. One of the things that sets the Switch apart from the above longboards is its deep concave which reflects the focus on technical freeriding and sliding. The comfy foot pockets you get from both the concave and the drop really give you the lock-in feel you need to try new things at high speeds. The Switch’s shape boasts huge wheel cutouts which allow very deep turns, including downhill. The deck is made from highly durable maple. As always with Landyachtz, the 180mm Bear Grizzly trucks are impressively strong and responsive, and can be flipped for commuting vs speed. The 70mm Hawgs soft and grippy wheels are top quality, so are the Abec 7 bearings. Although you do pay a premium for this board, if you want to take your freeriding skills to the next level, the Switch will give you the comfort, support, and confidence you need. The low ride, the comfortable deck, and the fluid trucks will also let you push commute fast and smooth for miles with minimal effort. Truly a great drop-down longboard to invest in. See price and reviews on Amazon. The last board I’ll look at here is this great looking 36″ x 9.3″ Santa Cruz longboard (Amazon), a smaller drop-down option for a more all-around type of riding compared to the previous boards. 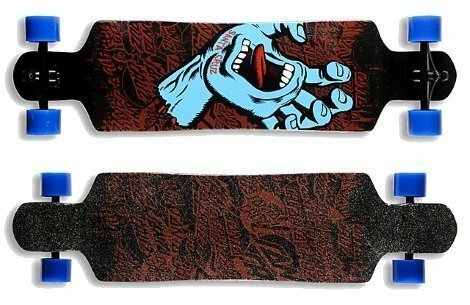 This Santa Cruz board with the Screaming Hand design is a cool-looking, micro-drop deck. It’s shorter and narrower than the Atom, Bannerstone, and Switch, with a smaller 29″ wheelbase. the smaller size makes this board a bit more nimble and easier to carry than the previous ones without giving up the low ride. This drop-down longboard is well-suited for a versatile mix of distance pushing (no deck rub here), intense carving, and freeriding. Similar to the Atom and Bannerstone, the slight concave on this Santa Cruz gives you a comfortable ride and some support for sliding while still offering freedom of movement for casual cruising. This Santa Cruz 36″ board comes with responsive 180º Bullet RKP trucks and quality 72mm 78A Road Rider wheels. This is a very nice all-around drop-down board including for comfortable commuting. See the reviews and price on Amazon. As mentioned above, a drop-down longboard is a deck with a lowered standing platform between the trucks, due to the deck being curved near the mount points. A drop-down deck is also called a drop deck or a drop platform (or dropped platform). These terms all refer to the same thing. However, drop down is different than drop through. A drop-through deck means the trucks are mounted across the deck through cutout holes in it, so that the baseplate of the truck sits above the deck and the hanger below it. While a drop down deck has a dropped shape, it can be either drop-through (with cutout holes in it for mounting the trucks across) or topmount (the trucks are simply bolted on the deck bottom). Drop down longboards offer more stability than other types of boards due to their riding low to the ground. This is particularly true at speed. A drop down shape is slightly different than a rockered shape. Rocker refers to the overall curve of the deck, an end-to-end arch with the center being slightly closer to the ground than the tips. A drop in the deck, on the other hand, refers to a small vertical drop near the truck mounts. While older drop decks like the Landyahtz Evo or the Globe Geminon used to have large drops, today’s trend is toward “micro drops”, which simply refer to a subtle drop in the deck. A micro drop still results in the deck being lower to the ground and providing good foot lock-in, but with a lesser impact on wheelbase length, truck leverage and responsiveness (see next section). As I mentioned, drop down longboards ride lower to the ground and bring your center of gravity lower, providing greater stability especially at speed. 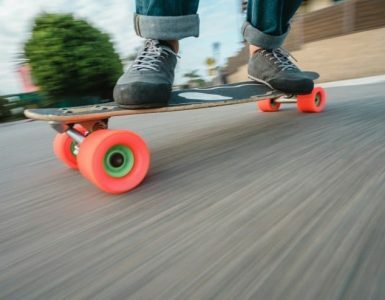 In addition to stability, drop downs make good freeride and downhill longboards because the front drop creates a comfortable wedge for tucking your foot, resulting in a secure stance at speed. Front and rear drops can also help secure your speed tuck in downhill. A dropped platform also has nice advantages for sliding. The ability to secure your feet on the deck drops makes sliding more comfortable. Top mounted decks with micro drops can provide a very comfortable stance. Slide initiation is also made easier on a drop down because the lower center of gravity results in less traction, i.e. less resistance and less tip from the board when you push it sideways, and when hooking back up after the slide. Drop deck longboard shapes also generally have large wheel cutouts allowing them to run very big wheels without wheelbite. Bigger wheels (e.g. in the 75-85mm range) allow for higher speed. 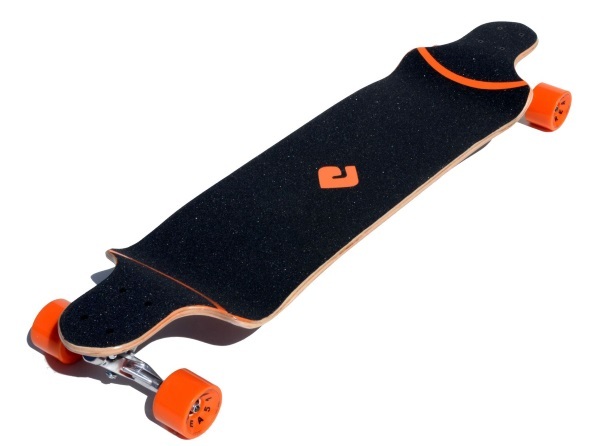 Last but not least, a drop down longboard being closer to the ground makes it easier to push and commute longer distances since your foot doesn’t need to drop as much to kick the pavement. Foot braking is also easier when riding low. The stability of drop down longboards is also ideal for newer riders who are working on their balance and basic riding skills. Traditional drop down longboards tend to be larger and bulkier with a longer wheelbase compared to other boards as the standing platform sits between (and lower than) the trucks – you can’t stand directly on top of the trucks. This also results in less leverage on the trucks due to the distance to your feet. Your weight is distributed differently onto the trucks compared to decks without drops. This can result in a less responsive board and less sharp turning e.g. for speed racing. If you’re a smaller rider, the added weight of some drop down longboards can also make it harder to break into a slide as more weight throwing is required. Likewise, you may find it harder to control your slide after initiation due to the weight of the board. These shortcomings, however, are not as much an issue for micro dropped decks since a smaller drop typically allows these boards to boast a shorter wheelbase and lighter weight. Average Skateboard Speed: How Fast Do We Ride?